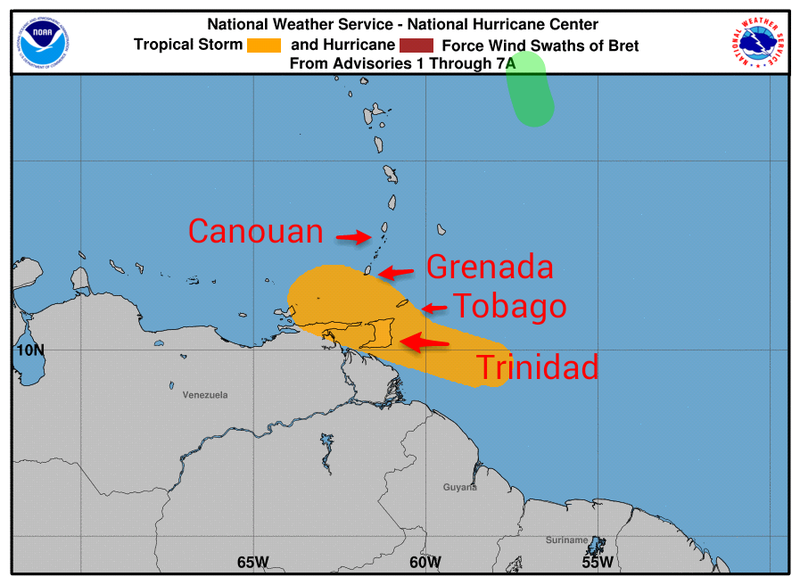 The winds were predicted to arrive Monday night, and they were right on schedule. High winds and rain, I don't know how high the wind got, but it was certainly "blowing up a storm". We put out extra dock lines, triple lines on the stern and double lines at both the bow and the center of the boat. We did not get a lot of sleep that night. Each of us was up at least once adjusting lines or adjusting fenders. The lines creaked and snapped all night long and Rhapsody was rubbing against the inflated rubber fenders causing them to squeak as they rolled between the hull and the concrete dock. Early in the morning after the lines and fenders were adjusted for the tide we noticed that one of our lines was frayed and about to snap as Rhapsody was moving back and forth in the swell. We were able to switch out the lines in time and all lines are continuing to hold. The winds continued to blow all day long and we decided to stay another day in the marina as our next destination is Tobago Cays which is quite exposed to the open ocean. Reports from friends in both Grenada and Trinidad were good. Neither place was hit too hard, although there was a catamaran that got loose in Grenada and apparently caused quite a bit of chatter on the radio as it was rescued. On the trip north to the marina we encountered several people who were dismissing the potential severity of the storm. In hindsight, their assessment was correct, and the storm stayed both south and remained a lower intensity. Would we do things differently next time, given the same criteria? Probably not. I was much more at ease heading north, away from the storm. I feel good about our decision, and I am also very glad that people who stayed in the more southerly areas remained safe.